Doctor Who's Peter Capaldi has passed on his sonic screwdriver to Jodie Whittaker who becomes the 13th doctor and first woman to take on the role of television's famous Time Lord. She follows a distinguished line-up of thespian (male) talent that stretches all the way back to the sci-fi favourite's first episode in 1963. William Hartnell was the first actor to play the Doctor on television, appearing in the BBC show from 1963 to 1966. Hartnell, who died in 1975, had previously appeared in TV's The Army Game and Carry On Sergeant, the first Carry On film, in 1958. While Hartnell was playing the Doctor on television, Peter Cushing could be found playing him on film in Dr Who and the Daleks, in which Roy Castle co-starred. That 1965 film and its 1966 follow-up, Daleks - Invasion Earth: 2150 A.D., depicted the Doctor as a human scientist rather than a time-travelling Gallifreyan and are not considered part of the Doctor Who timeline. When ill health forced Hartnell to relinquish the role, the Doctor regenerated - for the first time - into Patrick Troughton. Memorably scruffy and eccentric, Troughton spent three years travelling time and space before stepping down in 1969. When the raffish Jon Pertwee became the third Doctor, he also became the first to be seen on television in colour. His tenure, which ran from 1970 to 1974, saw the Time Lord exiled to Earth and working with Unit, aka the United Nations Intelligence Taskforce. Pertwee's time with the show also saw the first of the popular ensemble stories in which previous Doctors appear alongside the current one. Broadcast over December 1972 and January 1973, The Three Doctors saw him joined by Patrick Troughton and William Hartnell in what would be the latter's final acting engagement. When Pertwee moved on in 1974, Tom Baker moved in - and would become the longest-serving Doctor to date. Deep-voiced, curly-haired and eternally long of scarf, his seven years in the Tardis earned him legions of fans who were delighted anew in 2013 when he popped up at the end of a 50th anniversary special. When Baker finally stepped down from the role in 1981, his shoes were filled by the fresh-faced Peter Davison. The boyish actor spent three years as the Fifth Doctor before taking his leave at the end of the show's 21st series. Davison's tenure coincided with Doctor Who's 20th anniversary, celebrated by a feature-length special that saw him joined by Jon Pertwee and Patrick Troughton. The First Doctor also made an appearance, with Richard Hurndall filling in for the late William Hartnell. Tom Baker opted not to return for The Five Doctors, which covered over his absence by incorporating material from one of the actor's unbroadcast adventures. Similar subterfuge was required for this 1983 photo shoot, which saw Hurndall, Davison, Pertwee and Troughton joined by an unconvincing Baker mannequin. Davison's departure opened the door for another Baker to take controls of the Doctor's time-travelling police box in 1984. Colin Baker (no relation of Tom's) spent less than three years in the role, with his appearances limited further by an 18-month hiatus in production. Though Baker had limited time to enjoy the Tardis, he did get the chance to meet one of his predecessors when Patrick Troughton returned - for the third time - in 1985. The Two Doctors marked Troughton's final reprise of his signature role. Some years later, his sons David and Michael would both make Doctor Who appearances. Scottish actor Sylvester McCoy took over from Colin Baker in 1987 and played the Doctor until the show's axing in 1989. Michael Grade - the controller of BBC One at the time - was no fan of the programme, which was looking increasingly threadbare and cheap-looking in the face of glossier cinema fare. Some feel, though, that this period in the show's evolution has been harshly judged. An attempt was made to revive Doctor Who in 1996 with a TV film that saw McCoy regenerate into Paul McGann on American soil. It was hoped the special would spawn a TV series but it never materialised, making McGann's tenure the shortest of all the Doctors. In 2005 Doctor Who regenerated into the ambitious, well-financed property it is today. It also introduced a new Doctor in the form of Christopher Eccleston. To the disappointment of many, the Salford-born actor chose to make only one series of the rebooted show. His departure was confirmed only days after his debut episode was broadcast. Eccleston's exit saw David Tennant join the show, with his first full episode - The Christmas Invasion - shown on BBC One on Christmas Day 2005. Tennant's amiable style and enthusiasm made him a popular choice for the role, which he finally relinquished on the first day of 2010. The spate of junior Doctors continued with the casting of Matt Smith, who was just 27 when he made his debut as the Time Lord's 11th incarnation. 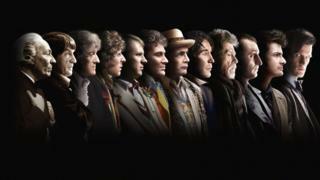 His four years in the role, which coincided with Doctor Who's 50th anniversary, saw the programme both maintain and bolster its renewed popularity. Doctor Who's 50th anniversary in 2013 was marked by The Day of the Doctor, a feature-length special in which Matt Smith's Time Lord was joined by David Tennant's version of the character. The Day of the Doctor also introduced a previously unknown incarnation of the Doctor, known as The War Doctor and played by Sir John Hurt. The character rejected referring to himself as 'The Doctor' and is not considered to have the same status as his fellow TV Time Lords. Peter Capaldi was no stranger to the Doctor Who universe when he was cast as the Doctor in 2013. A lifelong fan of the show, he appeared in an episode of the programme in 2008 and also had a role in its spin-off Torchwood. His hawkish features brought a new intensity, and maturity, to the Tardis from the moment his first full episode was broadcast in August 2014. Capaldi's most recent adventure saw him briefly joined by the "original" Doctor, played on this occasion by David Bradley. Bradley will return in this year's Doctor Who Christmas special. Bradley's appearance was a pleasing one for Whovians after his role as William Hartnell in An Adventure in Space and Time, a 2013 dramatisation of the show's early years. Jodie Whittaker has been named as the 13th Doctor and will be the first woman to play the role - if one discounts Joanna Lumley, who briefly played the Doctor in a 1999 Comic Relief sketch. Whittaker will make her debut on the sci-fi show this Christmas when Peter Capaldi regenerates.